Data is transforming the world and growing at an exponential pace. The SAS interface continues its dominance in traditional enterprise storage arrays, making the ever-increasing volume of data rapidly and reliably available. Storage solutions depend on SAS's protection features, such as dual-port failover for redundancy, and SAS's high reliability to power mission-critical applications such as ERP, OLTP, OLAP, and more. 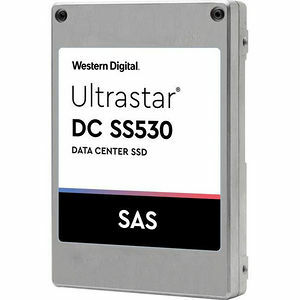 Designed with a dual port 12Gb/s SAS interface for seamless integration into enterprise environments, the Ultrastar DC SS530 SAS SSD is available in capacities from 400GB to 15.36TB, double the capacity of prior generations. Delivering performance up to 440,000 random read and 320,000 random write IOPS-best in class among current 12Gb/s SAS SSDs-the Ultrastar DC SS530 can help to drive faster data analytics, drive higher productivity, and power business decision-making.